Researchers are still learning about the science of sleep, but they’re clear on a few things, including the fact that loud and disruptive noises are not conducive to a night or restful sleep. Many people turn to white noise machines to block out external sounds, but that’s not the only reason to try a sound generator. If that were the case, people would just sleep with earplugs or noise canceling headphones. In addition to blocking out loud and jarring interruptions, some use these types of devices to help them relax and concentrate, too. Who Needs a White Noise Generator? So, what is it? Similar to the color of white light, which includes all of the colors of the spectrum, white noise combines all audible frequencies together. Often in a machine, it will be a repetitive hissing or whooshing sound, though it’s also been described as television static, waterfalls or a fan. Depending on which one you get, prices vary from about twenty dollars to more than one hundred. 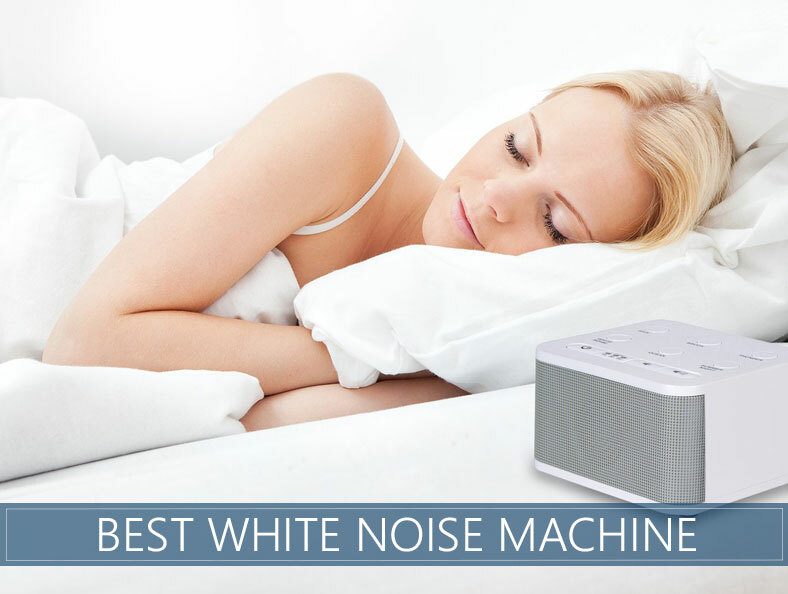 We’ve found that price and quality aren’t necessarily linked, so in this article, we share our opinions on the best rated white noise sounds machines available. People who own these devices swear by them, and if they have to suffer through even a single night without this electric security blanket, you’ll definitely hear about it the next day. They block out loudness from the outside. The sounds of car alarms, noisy parties, sirens, and traffic are all muted. Your partner’s nocturnal noises won’t keep you awake. Snoring, sleep talking, and other audible sounds won’t keep you awake. They create consistent sound, which serves to help you stay asleep. This means that sudden noises are less likely to wake you up. For example, it’s like sleeping with a night light on in the bedroom. If another light goes on, it isn’t as disruptive as a turning on a lamp in a dark room because there’s less contrast. White noise machines work the same way. The sounds of whooshing set on infinite repeat closely mimic the soothing vocalizations your parents did when you were an infant. The effect of hearing that throughout the night can help ease you to sleep and allow you to stay asleep. There are other applications for these magical sound generators, which will be addressed later in this article. They include helping babies sleep, relieving tinnitus symptoms, treating inner ear disorders, helping people with ADD and ADHD focus, and relaxing pets who have anxiety. This sleek looking machine features ten sound profiles, from oceans and rainfall to cities and trains. Yes, some people like sleeping to the sounds of a bustling city! And yes, of the ten options, there’s still classic white noise for the purists. Of these profiles, each one has three settings, which gives you a total of 30 options to choose from! One of our favorite features is the auto-turn off that happens after 30, 60, 90 or 120 minutes. It’s a subtle switch, avoiding a sudden sound cut off that could risk waking you up. The display is lit so you can see it at night, but also has a dimming option to prevent excess light from overly illuminating your bedroom. The engineers at Sound+Sleep thought of everything, including having upward facing speakers, which distributes the sound in a more realistic way. There’s also a headphone jack, so if your partner finds it disruptive, you can experience it on your own without bothering them. You might notice that the Sound+Sleep comes with a higher price tag than many competitors. The most distinguishing feature of this brand is that the soundscapes are non-repeating. There are less expensive models that have the profiles on a continuous loop. Discerning ears will start to pick up on those patterns and count the seconds until the soundtrack repeats can keep you awake, defeating the purpose. The MARPAC line is a top choice for people who want to travel with their machines. MARPAC is one of the original makers of this technology, and instead of a speaker, the device uses a fan to create the hum. The airflow is covered, though, so you won’t feel a breeze. 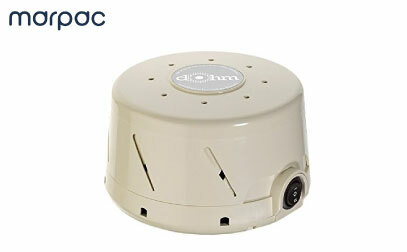 The people who love the MARPAC Dohm-DS most are the ones that used to sleep with a fan to simulate white noise. But because the audio frequency from the fan can vary if something gets in the way, not to mention how disruptive the air can be, many people who like the sound of fans have come to enjoy the same experience without the drawbacks. Despite the lack of fancy settings, you can still customize the volume, pitch, and speed so you can choose what works best for you. A lovely touch is the inclusion of a bonus eye mask in stylish black. LectroFan is a top choice because it packs a ton of features in a compact package with a relatively lower price tag. 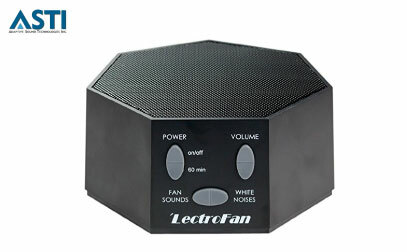 As well as ten fan sound settings, the LectroFan also has several color noise spectrums, including white, pink, and brown. The audio tracks are non-repeating, which is an important feature and something to look for specifically if you’re adept at picking up on patterned sounds. 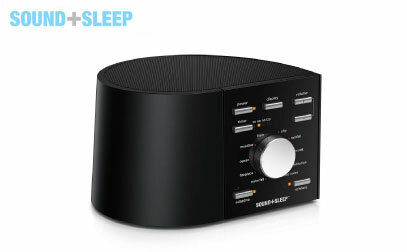 Similar to Sound+Sleep, it also has a top facing speaker, volume control, and a shut-off timer. Many people rely on the LectroFan for travel. Its compact size makes it portable, and it can be used with either an AC power adapter or a USB cable. And finally, compared to competitors, the LectroFan uses a fraction of the electricity, so if you’re trying to conserve energy and save on your power bill, you’ll love this brand. The HoMedics brand has many of the features of more expensive options, but at around a third of the price. It comes standard with six sound options, including ambient natural landscapes and, of course, white noise. You can also adjust the volume, set a timer for when you drift off to sleep and travel with it (batteries not included). Something to consider with the HoMedics brand is that many users complain about the durability of this device. They report that it breaks within several months of using it. However, most people continue to buy it because they’ve found that it’s still their favorite! The name rooster might make you think that the Big Red will keep you up at night, but the opposite is true. 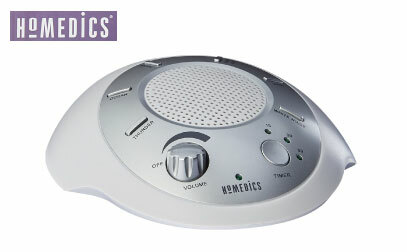 Like the Homedics model, it has six sound settings, volume control, and a timer. The volume knob is a necessity with this machine because it can be loud if you turn it up to the max! You can travel with this device as it has a slot for batteries, or you can plug it into the wall. There is a light on the unit that’s not dimmable, so many users choose to put it on the floor if they’re sensitive to brightness. Even if you’re not a parent, you know that babies are notorious for being light sleepers. The slightest sound can jar them from a restful sleep and turn them into inconsolable terrors. As soon as their bundle of joy has fallen asleep, parents will go to great lengths to make sure they stay asleep. These devices are invaluable and are often at the top of a baby shower registry for new and veteran parents alike. It’s like an insurance policy that decreases the number of times a baby or child wakes up throughout the night. Whether you or your partner snores, one of these machines can help. If your partner is the one with this loud habit, it can drown it out, and if you’re the one who keeps your partner awake in frustration, this machine could be the glue that holds your relationship together. The ringing in your ear that comes with tinnitus can be masked or completely eliminated with a high-quality sound generator. It may seem mysterious, but white noise has been shown to help some with dizziness and vertigo symptoms. It’s unclear whether there’s something about the noise itself that eases symptoms associated with inner ear disorders, or if it’s the fact that people who get better sleep can diminish the symptoms of these conditions. People with ADD and ADHD are often distracted by the smallest of things that other people tune out entirely. The steady drone of a machine can help with those distractions. Our pets are sensitive to what’s going on inside and out, and often can experience anxiety. 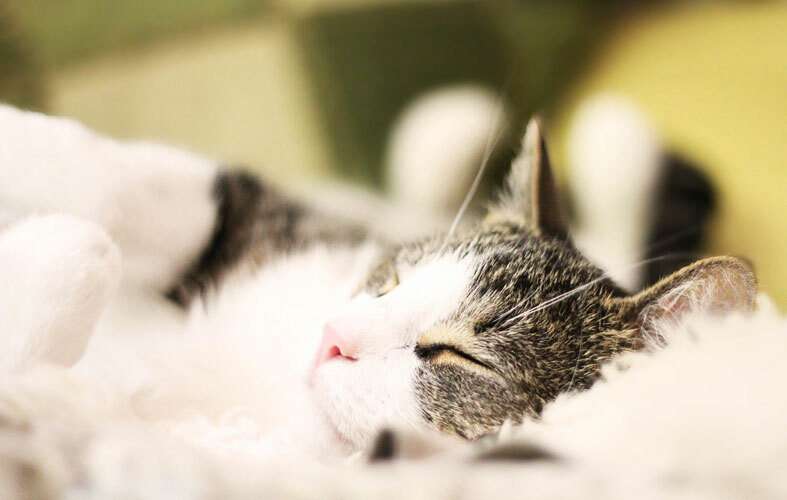 Both soothing nature sounds as well as repetitive whooshing noises have helped numerous pets sleep better and feel relaxed. Even though nature sounds are technically not white noise, they’re often lumped into this category and included in noise generators because of their soothing characteristics. The most common nature soundtracks include ocean, rainfall, forests, jungles, waterfalls, and crickets. There’s a steady hum or drone of machinery that can be comforting. Examples include a washing machine, electrical fans and air conditioning units. Many of us get used to having activity around them and can feel restless in the face of silence. Hearing a muted conversation from a crowd, or the bustle of traffic (minus the horns) can be effective in helping some people fall and stay asleep. While these machines are lifesavers for a lot of people, they should be used with caution among certain groups. The most notable danger posed by this device is when infants and young children are exposed to its effects over long periods. It can affect their ability to perceive where sound is coming from as well as potentially delay cognitive development. Our advice? If you rely on an electrical noise generator to help your baby sleep, avoid the temptation to use it every single night. Skipping a night here and there will help prevent these potentially harmful effects. Another thing to keep in mind is that those with tinnitus might not even know they have it if they constantly use a noise-diminishing device. Since the condition is often associated with more serious disorders, make sure that you try a night or two without your machine to make sure you don’t have tinnitus. Where you should put it will depend greatly on what you’re using it for. Many people choose electrical sound generators for the office, and if that’s the case, you can put them just about anywhere. People who use them for sleep typically put them next to their bed, although if yours lights up and light is a potential trigger to keep you awake, try putting it on the floor next to your bedside. Can I use it when I travel? 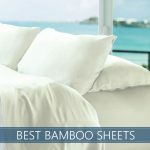 Traveling is one of the best times to use a white noise machine! It’s because you’re in a new and unfamiliar place, which can make it more challenging to fall and stay asleep. If you plan on traveling with one of these devices, look for a smaller design that has the option to put in batteries. Are there apps available for white sound generators? Great question! If you don’t want another piece of equipment in your home or in your suitcase, you can get an app on your apple or android smartphone to have this sleep aid without the hardware. There are both free and paid versions depending on how many features you’d like. Getting enough sleep in today’s busy (and noisy) world is a top challenge for most people. It’s like the world is conspiring to keep us in a constant state of sleep deprivation. From noisy neighbors, to crowded cities, to our snoring pup, there’s a lot to keep us awake. A noise machine is an effective way to balance out all those sounds and help you get the blissful sleep you deserve. Should You Be Sleeping on an Air Bed Every Night?